Consistent with the Simmons Beautyrest Black Raquel Luxury Firm Mattress, the cover is what immediately draws the eye upon the first inspection. The top of the mattress is a neatly woven white High Definition Luxury Cover which comes in direct contrast with the cool slate grey woven sides of the bed. They meet in a gusseted union, giving the bed a very crisp look. Overall, the Simmons Beautyrest Black Mariela Luxury Plush Mattress evokes a crisp, clean, and very modern vibe. It clearly compliments its firmer mate, the Simmons Beautyrest Black Raquel Luxury Firm Mattress. Moving in for a closer inspection I perch on the edge. The initial feeling is of being well supported, which is somewhat remarkable for a plush mattress. Although it is notably softer than the more firm model, it still provides a good amount of support on the edges. I do sink in slightly, but when I stand up I notice that the Simmons Beautyrest Black Mariela Luxury Plush Mattress has a quick reaction time. By the time I’m standing up fully the memory foam layers have regained their shape, and it looks just as crisp and cool as it did before I sat down. The memory foams regain their shape in less than 5 seconds, leaving me to consider the advantages that brings. A quicker response time means less motion transfer. In other words, I won’t have to carefully creep after that midnight glass of water in an attempt at not disturbing my partner. I crawl to the center of the bed and starfish out, sprawling my limbs out to the corners of the bed, and take a deep breath. As I exhale I feel my body relaxing into the moderate plush support. Plush mattresses will typically envelop you slightly as the memory foam resists your weight providing deep contoured support, and this one is no exception. 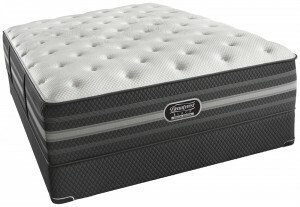 Although this is a plush mattress I make note that it is not one the most plush models in the Beautyrest Black lineup. It rates at about a 60 on our Comfort Scale, while the Simmons Beautyrest Black Tatiana Ultra Plush Pillowtop Mattress rates an 80 and is one of the plushest options available in the Beautyrest Black line. Because the Simmons Beautyrest Black Mariela Luxury Plush Mattress has a best-of-both world’s comfort rating this mattress offers a plush feeling without lacking in support. As I settle in and get comfortable I note that the memory foams and Nanocoils really do provide deep contouring. My back feels fully supported, the bed seems to reach up toward my lower back and provide support where I need it most. I feel like I have good spinal alignment and that am fully supported, from head to toe. There are no gaps in support, the mattress contours to all of my curves creating a feeling of deep supportive cushioning. It is not uncommon for larger individuals or those with back issues to prefer a firmer mattress because it will keep you better supported and in proper alignment. That being said, an individual who prefers to sleep on their side or back may enjoy a plusher feel. For the individual seeking a moderate plush feel while still offering some support, this mattress delivers. As I gather my legs in to roll onto my right side I again notice the quick response time. No sooner had I rolled over than memory foam regained its shape, rising up to support my side. My hips are sunk the deepest into the mattress, while my waist is still supported. There are no gaps between my frame and the mattress surface, I feel well-supported and relaxed. My shoulders don’t sink into the mattress as far, and I feel as though this keeps me in good alignment. Overall it is very comfortable to rest on your side, and I appreciate the plush support. Overall, the Raquel Luxury Plush Mattress is incredibly comfortable and very luxurious feeling. On the Comfort Scale, it rates a 60. Aside from its firmer counterpart, the Simmons Beautyrest Black Raquel Luxury Firm Mattress, the Simmons Beautyrest Black Raquel Luxury Plush mattress is most comparable to the Simmons Beautyrest Black Mariela Plush Mattress. The only difference between the two is the Raquel Luxury Firm has Contour Support Nanocoils, which provide a faster response time and a more supportive feel. The mattress cover is crafted with the Black High Definition Luxury Cover, which is a high definition knit fabric designed for phenomenal breathability and a luxuriously soft feel. It really is just incredibly soft and intricately woven. The design is very crisp looking while still feeling luxurious. This inspired piece of technology is woven into the very fabric of the cover. 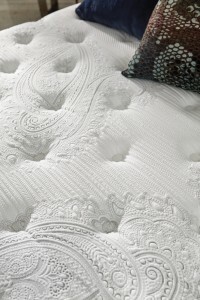 The SurfaceCool Plus Fibers are vertically woven into the bed. This cutting-edge technology was created to keep you cool and comfortable, so you can rest peacefully. Simmons achieved this result by vertically integrating Tencel fibers, which are natural fibers derived from wood pulp. The vertical orientation is designed to create airflow channels promoting a faster transfer of heat and greater breathability. You may have noticed that temperature control is a reoccurring theme within the Beautyrest Black line; this is in response to feedback received from real customers. Simmons actively works to keep well-informed and address issues and concerns customers have previously expressed and this innovative new technology are in direct response to customer demand. For additional temperature control, check out our Malouf Woven Tencel Sheets or the rest of our selection of Linens. This innovative and cutting-edge gel memory foam combines the properties of gel and memory foam to provide you with astonishing pressure relief. The freedom of movement is exceptional due to the fast response time of Simmons’ proprietary gel memory foam. This memory foam gives the bed a softer feel, molding to your body’s unique curves. This deep contouring memory foam provides soft and comfortable support and pressure point relief. The Contour layer is given a supportive feel with the use of Dynamic Response Memory Foam. This material is commonly used in several of Simmons models due to its breathability, versatility, and more supportive firm feel. It is exclusive to Simmons and in innovatively molded rather than made using the continuous pour method. 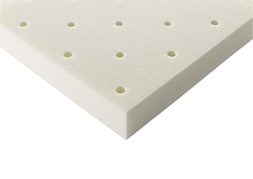 The molded pour foam is created using a ventilated mold creating a continuous air flow channel grid pattern. The airflow channels are found throughout the foam layer and allow a deep contouring while not sacrificing breathability. Due to the firmer density, this foam also adds to the supportive feel, allowing for a conforming back support and pressure relief. The Supportive base of the Simmons Beautyrest Black Raquel Luxury Plush mattress is formed from the Advanced Pocketed Coil layer. Since Simmons invented the pocketed coil in 1925 there has been no shortage of copycats and innovations, ultimately this drove the market forward paving the way for some truly remarkable innovation. The Advanced Pocketed Coil is not available in any other Simmons line and is used exclusively for the Simmons Beautyrest Black line. 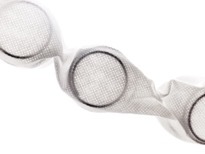 The top-of-the-line Advanced Pocketed Coil is the only one manufactured with high carbon steel coils. The coils are triple strand wrapped, creating a stronger and longer lasting coil. These coils are designed to be more durable and hold-up better over time, even under strenuous use. The design prevents motion transfer, meaning that you’ll sleep through the night if your partner gets up for that glass of water in the middle of the night. Because the coils conform to fit your individual curves, when you change sleeping positions only the coils supporting you shift, meaning the rest of the bed remains still and undisturbed.